These 51-person Securall Storm Shelters are designed to provide protection during severe storms. They are perfect for offices, schools, trailer/RV parks, campgrounds, construction sites, public venues, and more. 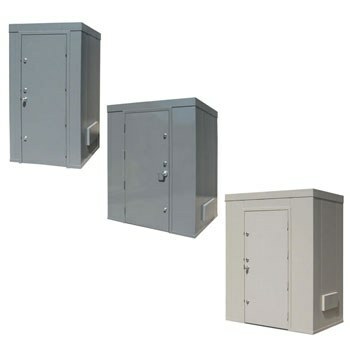 With enough room to safely house people and supplies during severe weather incidences, these units are ideal for offering safety in otherwise vulnerable locations. These units are constructed of 12 gauge, formed steel wall sections which are welded together for ultimate strength. The roof is constructed in the same fashion and is also welded to the rest of the structure. High-capacity bolt down anchors provide for proper anchoring to your concrete surface. A heavy-duty 36"W FEMA 320 door allows for easy access while also providing sturdy resistance to high winds and debris impacts. 3 deadbolts and a strong, lockable lever style handle, all keyed alike, secure this door.